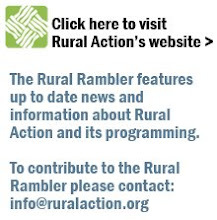 The Rural Rambler: New Straitsville Has a Rain Garden! New Straitsville Has a Rain Garden! New Straitsville has a new attraction to add to the war memorials and historical sites of the Village! A rain garden has been planted in front of the village storage building on Main Street by the staff and interns of Monday Creek Restoration Project. The storage building recently received a new look with a patriotic mural and now the rain garden accents the site, adding more color and beauty to the town. The garden is designed so that rainwater from the roof of the storage building will flow into the garden rather than flowing across the sidewalk and into the street. This garden will add the beauty of flowering plants while reducing rain runoff. The rain garden features perennial plants native to Ohio. The plants were purchased from Companion Plants in Athens, Ohio. Funds for the plants were donated by several residents of New Straitsville and the New Straitsville area. Coal Township Trustees excavated the area and local youngsters shoveled topsoil into the excavated area. Once individuals heard about the rain garden project, they were eager to help in any way they could and Monday Creek Restoration Project is very grateful for their support! Rain gardens maintain themselves after the roots of the plants are established. The garden will be sustained by runoff from the storage building and only need watering during dry conditions. The garden will be a fairly low maintenance attraction for both the residents and visitors to New Straitsville.